GBP continues messing up the markets after the Brexit. Another pointless spike has happened early in the morning, just to close your stop losses with a huge gap and then retrace back to where it was before. 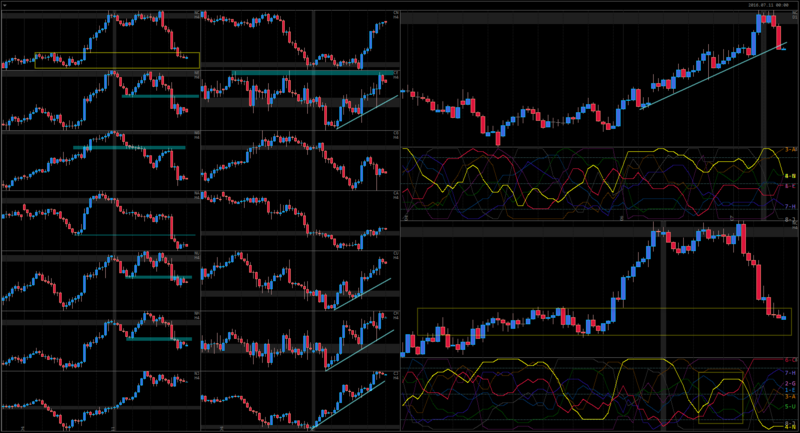 Such situations are only further confirming that trading on lower timeframes is not safe any longer. If your stop loss would have been 100 pips, you would have lost “just” 5-6 times your planned risk (depending on how well your broker would execute your stop order). With a stop of 20-30 pips, you would have lost 20% instead of your planned 1%. 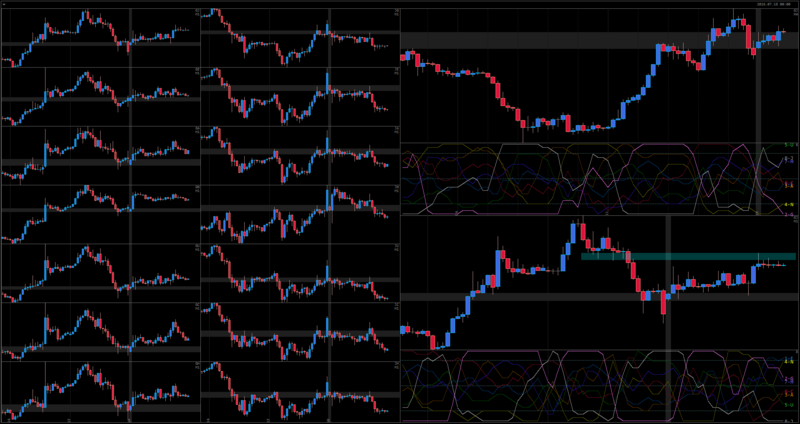 As mentioned earlier this week, EUR has managed to form a bullish cycle on Weekly. However, the price action has been quite week and it does not seem likely that EUR can pull off breaking very strong resistance on almost every single pair (see the picture). JPY has bounced from its support areas as well, and will possible continue trading in the Daily range, as seen on the charts. Overall, EJ is a good trading pair to watch for a potential bearish trend. Both USD and CAD have been depreciating to most other currencies, and yet neither managed to trade in a good long term trend. Their cross pair has been trading with very choppy price action for the last 5 months. Every time we come to the boundary of such range, it deserves our attention. At the moment, both USD and CAD are trading at the top of their respective bullish cycles, with USD barely winning over CAD. This move has taken the price right to the top of the flat boundary. The price has got there without any convincing strength, so it is hard to expect a strong bullish breakout. Given that USD has managed to reach the top of its bullish cycle even on Weekly, without showing any strong price action in that cycle, it does not seem likely that it will keep on appreciating. CAD however, being at the bottom of its bearish cycle on Weekly, has more potential to go higher for a while. It is very likely that the price will stay in the range, but thanks to its considerable size, we can still trade UC on the short side. A very weak and conflicted price action today. Not a single currency managed to dominate, but GBP and JPY are the two strongest in the end. After a strong bullish week on GJ, clearly visible on H4, it closed with a strong bearish day on Friday. The worst possible scenario for bulls is to see price action in their direction, but showing clear signs of struggle. Bulls did manage to raise the price by the end of the day, but given that this is the strongest move on the Market today, and comparing it with the prior bearish move on Friday, it looks like the bears are far from done in this pair. The Market is already offering good selling price right now, it will be very interesting to watch how the traders bet their money tomorrow. After showing strong bearish move yesterday, today GBP completely reversed and put up a bullish move. Interestingly, half of this move happened in the very early hours, before BOE kept the interest rate unchanged. No matter how much fear mongering media will create, at some point there will not be any trader willing to sell GBP this low. It will be interesting to see if it creates a significant bullish cycle on Daily-Weekly. NZD has been the most bullish currency in the past couple weeks and now it also starts correcting – possible even reversing. RBNZ will be meeting on 10th of August and unless NZD depreciates by then there is a very good chance of a rate cut. The Market would normally price upcoming change before hand, so we might see a bearish cycle on NZD for the next 3 weeks. Together, GBN and NZD represent two of the most interesting currencies at the moment, because they have been leading the whole market (together with JPY) recently. The bullish move created by NC at the end of the last week is completely cancelled now. The price is approaching Daily TL. 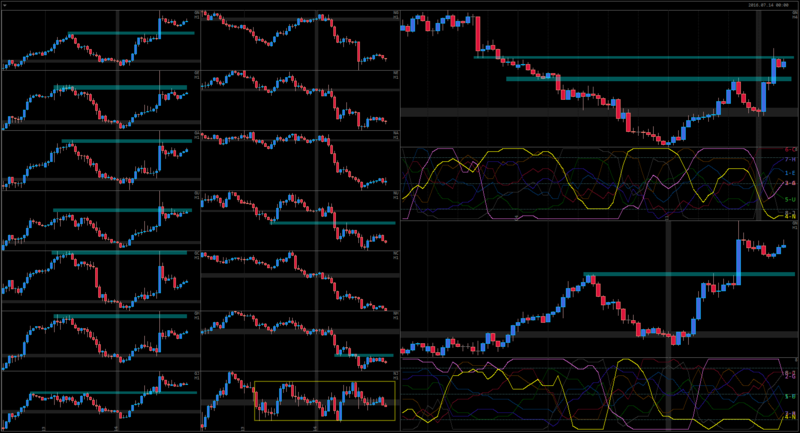 Looking at NZD profile on H4, many pairs have broken below their recent swing lows. 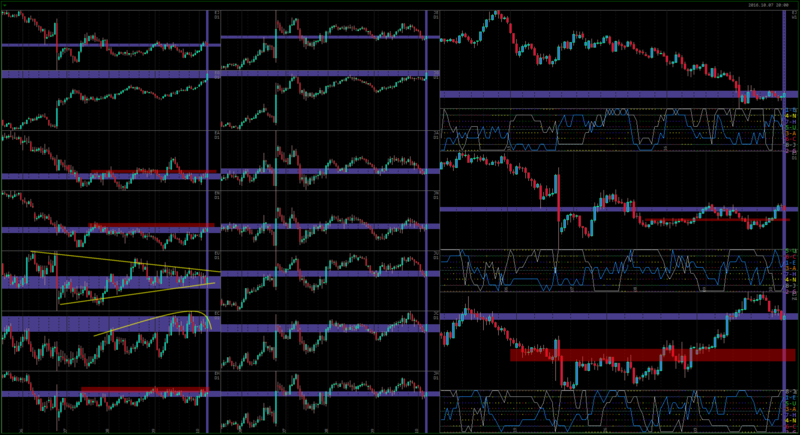 Looking at CAD, the bullish move this week is very well sustained so far (with exception being CG). 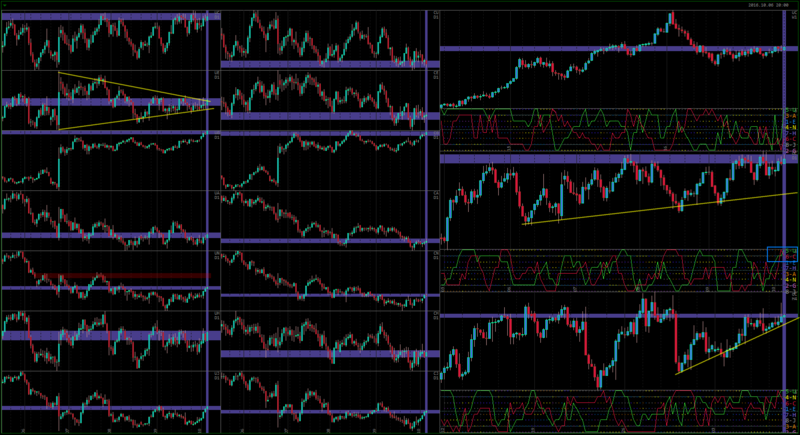 However, CAD is slowing down and is very likely to correct in the last couple days, before it can continue higher. Supply is coming at these higher prices virtually on all CAD trading pairs.